CINCINNATI (AP) — Hines Ward was Tyler Boyd’s favorite Steelers player while he grew up in Clairton, Pennsylvania. He loved how No. 86 made the tough catches in the biggest games and helped Pittsburgh win two Super Bowls during his 14 seasons. Boyd got to know the Steelers when he went to Pitt, which shares Heinz Field with the Steelers. Instead of being drafted by them in 2016, he wound up going to the rival Cincinnati Bengals, who were looking for a slot receiver to complement A.J. Green. Boyd immediately redirected his goal toward beating his beloved black-and-gold team. So far, he’s 0-for-4. The Bengals (4-1) have dropped six straight to the Steelers (2-2-1), a streak that’s the talk of the town as Pittsburgh arrives for a game Sunday at Paul Brown Stadium. Boyd has played in three of the games. All three times, he has walked off the field watching thousands of Steelers fans twirl their Terrible Towels — a scene he once enjoyed. So far, there’s been little to talk about. Boyd had his best game against the Steelers as a rookie. He caught six passes for 78 yards in the second game of the season, a 24-16 loss in his return to Heinz Field. He also had a decisive fumble. He caught a pass at the Pittsburgh 33-yard line and was stripped by James Harrison. Pittsburgh recovered with 1:50 left, ending the Bengals’ comeback attempt. Boyd had two catches for 13 yards in the rematch at Paul Brown Stadium, a 24-20 Steelers win . 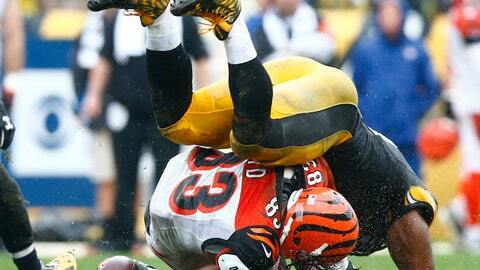 Last year, Boyd suffered a knee injury and missed a 29-14 loss at Pittsburgh . He had two catches for 15 yards in a 23-20 loss to the Steelers at Paul Brown Stadium. Thousands of Steelers fans twirled their towels as Pittsburgh ran off the field after Chris Boswell kicked a 38-yard field goal on the final play. The scene was familiar to Boyd, who attended a handful of Steelers games as a youth. The Bengals are counting on significant contributions from Boyd, who is having his best season. He leads the team with 30 catches — Green is second with 26. Boyd knows many of the Steelers from his playing days at Pitt, when they used the same stadium. “When we were at practice, me and James (Conner) always talked to (Mike) Tomlin and Le’Veon (Bell) and AB (Antonio Brown),” Boyd said. “I would ask AB how he would work a route in certain coverage, just little things like that. NOTES: Running back Giovani Bernard was ruled out Friday with a knee injury, the second game in a row he’ll miss. … Tight end Tyler Kroft also is out with a foot injury. … Center Billy Price will miss his fourth game with a partially torn ligament in his right foot. … Cornerback William Jackson (knee), receiver John Ross (groin) and offensive tackle Cedric Ogbuehi (wrist) are listed as questionable.